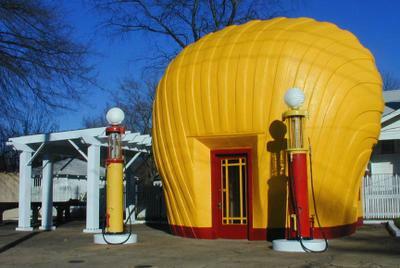 Who knew there was a Frank Lloyd Wright gas station? 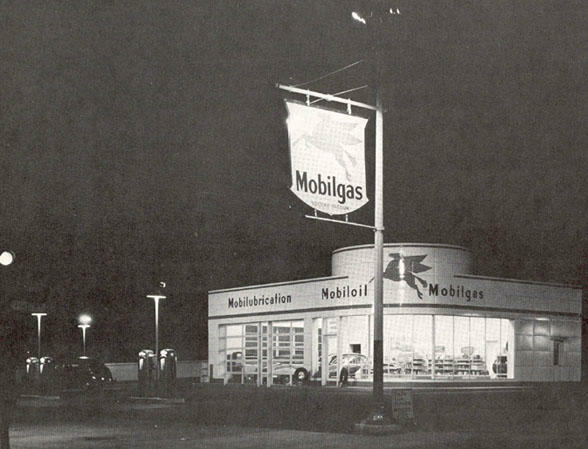 I have been doing a bunch of online research (codename for wasting time) about streamline moderne, pre-fab, porcelain-enameled, steel gas station buildings and have learned almost nothing about them. But found lots of other cool gas stations. 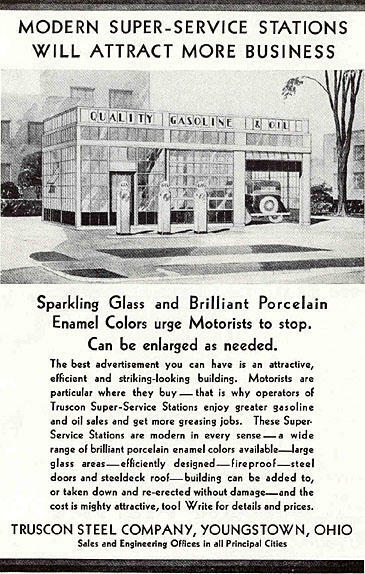 Frank Lloyd Wright's only gas station had glass skylights over the service bays - sensible by any standard - and a second story glass observation deck, which, is perhaps, only sensible to me. 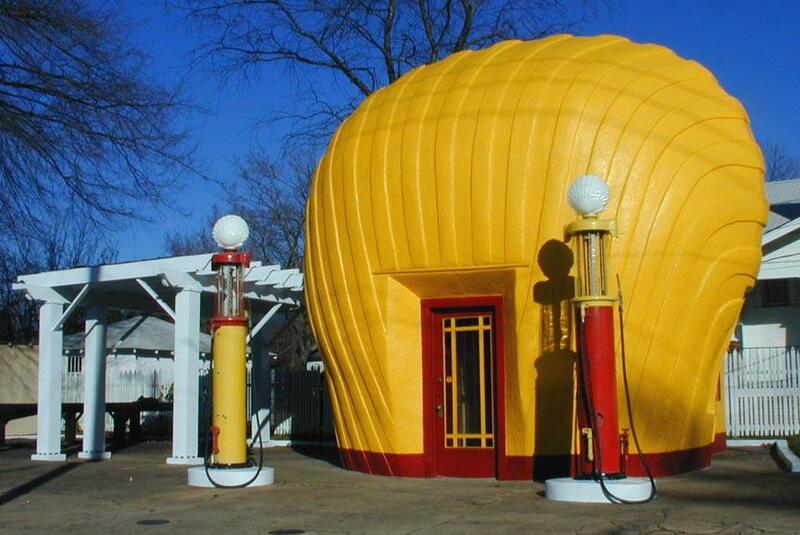 I had read about this concrete Shell station ages ago in Preservation magazine as a North Carolina preservation what-have-you organization was trying to restore it as an office. Looks like a giant piece of candy corn. It's so appealing, you just want to touch it. Of the original eight built, this is the last one standing. Can you imagine being the ninny that decided to tear one down? Why tear it down? It is so small you can practically fit it in your pocket. That is certainly a compelling case. 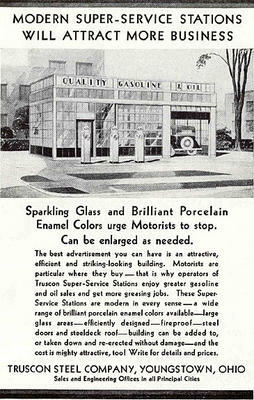 Youngstown, I am sure not by coincedence, was also home to the Youngstown kitchen cabinets. "Taken down and re-erected without damage" Uh huh. That is the key. 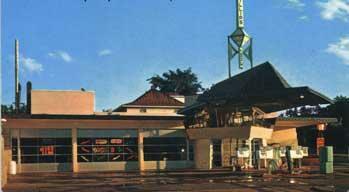 There is a closed down gas station in Los Angeles constructed in this Philip Johnson Glass House International-by-way-of-Ohio style. I have spoken with the owner as there is a perpetual For Lease sign. His great hope is to ground lease the location to El Pollo Loco. Every so often, I stop by and say hello, each time pointing out that I want the building if his tear down dreams come true. He looks at me like I am crazy and sort of says that he will call me. I hope he does and hope he doesn't.